Thanks to everybody who came. The rain missed us and the wind wasn’t quite as fearsome as the forecast said. 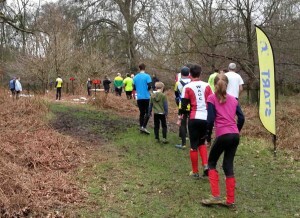 Sorry, you did get muddy, especially on some paths, but the forest was lovely to run in. Thanks again to the National Trust at Ashridge. Everybody was complimentary about Laura and Kevin’s courses, and Ronan and Julie Cleary as controllers made sure we didn’t miss a trick. Thanks, as ever, to the brigade of helpers from the club who made the event run so smoothly. There is some lost property including clothing, a compass. 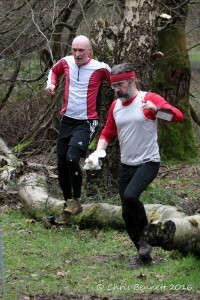 Contact events <at> herts-orienteering.club to claim it. Winners of M21 and W21 – and the next generation? 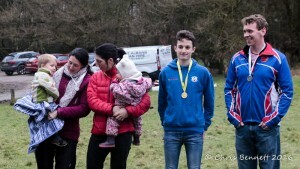 If you were in the first 3 in the SE Long Championships but missed the prize giving and would like your medal sent on, please respond to the same email address. We were initially asked to control the Ace of Herts 2015, to be held at Egypt Woods and Burnham Beeches when the contractors started felling the forest. So HH asked us to pick up the role for this year in Ashridge. When the National Trust had reservations about giving HH permission for the event, we began to feel like a jinx! But NT had a rethink (mainly about car parking) and when they agreed to move us to the Ivinghoe road for the Assembly, it was all systems go. This enabled the planners to introduce a northerly perspective and different approach angles to most competitors who had competed at Ashridge before. Kevin’s and Laura’s courses were well received and justifiably so: with a wood strewn with paths they decided to go for long legs and route choice options wherever possible. There were 81 controls used, and they tried to keep you off tracks for the most part. In the last month, the bracken has died down so times on many courses were fast, but many people said the running was relentless, and if they lost their line, relocation was very time-consuming. We were pleased to see most White & Yellow competitors successfully finish their courses. With the rain this winter, the tracks are as muddy as we have seen them, and of course, little legs suffer much more with muddy paths. So well done all of you. Mike’s organisation was always calm. From the Team Leaders meeting in January to Sunday, he was never flustered. And having Helen as his sounding-board, we were never particularly concerned. The event had a “big occasion feel” with the marquee, shelter tent, table for control descriptions so they didn’t get muddy, priority parking etc, as befits the SE Championships and a Level B event. Thanks are due to Susan Crickmore (SO), Mike Elliot (MV) and Mark Thompson (TVOC) who agreed to be the Jury: fortunately we didn’t need them. And finally the weather held fair on Sunday: over the past few months, we have seen sunshine, strong winds, snow, and flogging rain on Saturday for our “stake-checking”, so thanks go to whoever arranged that! Julie & Ronan Cleary, London OK.